We all have a home office, whether we manage all the business of running our home or we have a home-based business. Why not make your office supplies not only functional, but fun to look at? 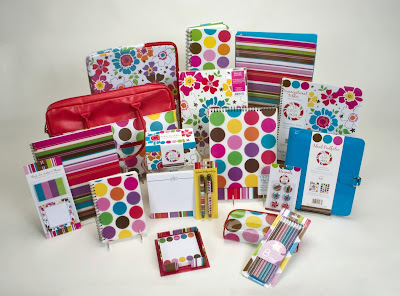 Carolina Pad offers a full line of office, school, and art supplies to help you in your home office One of my lucky readers will win a Carolina Pad Office Set Collection with a value of $150 in this giveaway. The winner gets to choose either Eye Candy (pictured above) or Simply Chic (pictured below). 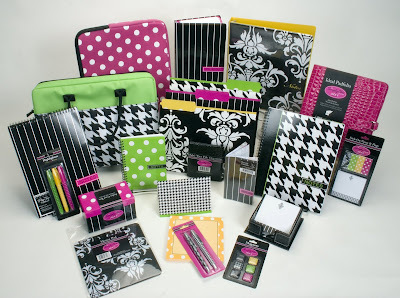 Read how Frugal Coupon Living uses her Carolina Pad products to stay organized and save money. I will be bringing you my own product review sometime before this giveaway comes to a close. I had so much fun browsing the collections at Carolina Pad and love the uplifting colors and designs. Find out why others are falling in love with Carolina Pad products. And watch for a Freebies 4 Mom product review coming soon! You've probably seen Carolina Pad products at your local stores like Walmart, Target, CVS, Walgreens, Kroger, Office Max, Office Depot and more. They are everywhere! Become a fan of Carolina Pad. Another way to learn about their hot new products and promotions. Want a chance to win the monthly giveaway? Sign-up for the monthly contest notifications so you can enter for a chance to win products! The email addresses that I collect for this giveaway will only be used for the purpose of contacting the winner, and will never be given to anyone. This giveaway will close Friday, May 29 at midnight (CST). I'll announce the first name of the winner in a new post the next day and contact the winner by email. I will draw the name of the winner by using the random number generator at Random.org from the eligible entries received. If a winner does not contact me within 48 hours by email, I will draw a new winner. This giveaway is only open to residents of the United States who are 18 years of age or older. The winner will receive their choice of the Eye Candy or Simply Chic Office Set Collection valued at $150 directly by mail from Carolina Pad. You must complete this form to enter this giveaway. Required questions have been marked. Browse here to pick your favorite Carolina Pad collection. Please only enter this giveaway only once per household. Good luck and remember that you need to complete the form to enter this giveaway. You are welcome and encouraged to post comments here, but any comments will not be considered as entries in this giveaway. Just for fun, please leave a comment and tell us which collection you fell in love with and why it would be perfect in your home office! My favorite is Eye Candy, pictured at the top of this giveaway post. Thanks for entering and come back Saturday, May 30 to find out who won. Freebies 4 Mom Giveaway Disclosure: Carolina Pad sponsored this giveaway by providing one office set collection to give away. They also provided me with a sample of their product so that I may write a product review before this giveaway closes. Carolina Pad does not compensate me in any other way. I like graphic In Nature and my favorite is Pearl Pinstripe, it's colorful and fun. I couldn't pick a favorite if I tried all day, I am a paper freak, have always been!!!!!! Those are so cute. Cute products like those even the most mundane projects fun! I love the Simply Chic and Prints Charming. But really, they are all really darling. I like a lot of them but Graphic in Nature was my favorite one. I kept going back to it. Happy Birthday! This are so cute. I have a real love for notepad and office supplies. These are by far some of the cutest I've seen! i would like it for my work. I just love the colors. very nice!!!! I LOVE THESE. THEY ARE SO COLORFUL AND HAPPY. MY BABY, MIA, (AGE 10) LOVES THEM TOO. IT WOULD BE NICE TO WIN (AND THEREFORE, NOT BUY FOR ONCE). THANKS FOR HAVING THE GIVEAWAYS. I absolutely fell in love with Hot Chocolate. I love anything that is brown based. My husband says I would paint every room in the house some shade of brown and accent with pinks, greens or blues. I'd love to win this office set. Never enough paper ! The cuter the better ! Love the warm colors of the Hot Chocolate collection, it's so inviting. I'm glad you picked my fav for the giveaway thanks for the great info. I am a paper junkie. I love notepads and card stock, I could look at paper all day! My favorite, I think, was Hot Chocolate but they are all cute! Great Giveaway! Wonderful products! So uplifting! I wish they existed in wallpaper too! I love the Eye Candy collection too. Very adorable. I love Prints Charming. So graphical and yet feminine. Hot Chocolate is my favorite! I have the binder and LOVE it! This is all my daughter will use for school and our favorite is eye candy as well! It does brighten up an office day. Oh, I just love all the fun, whimsical patterns! It would brighten every task as I opened something asaesthetic as these! I work in the HR Department and this would be great. Love the colors this would be fun when I need to leave notes to people. What great products!! I already have several things from Carolina Pad and always get compliments! ;) Love it! love hot chocalate. I already bought the file folders and love it.! I think the whole selection is so cute. Someone will be very lucky to win this! I actually already bought an Eye candy notepad in the Kendall collection. I love the bright colors on it! Very hard to pick a favorite. They are all so neat. I could use a different one for every list or project I have! These rock. I am an office manager and these bright and uplifting office supplies could help get me through my often drab day! I love the eye candy, very cute! Actually the eye candy is my favorite! I love polka dots and all the bright colors! I love hot chocolate; the browns with the brighter colors is gorgeous. Graphics in Nature was a second! I have always loved these, and have to fight my daughter for them. I have purchased much of the collections with my own money and brought them into my office! I buy these all the time. It's hard to choose just one item. Colors are great and cheerful for any day of the week. They make boring chores FUN! I love the Eye Candy! I really like colorful things! I really like eye candy--it's bright and colorful--just plain cheery!!! I would use the Graphic in Nature in my office. But I think that Whimsical Flower is very fun. I LOVE to Graphics in Nature collection! Such subtle colors but simply beautiful! I saw this at Target the other day and bought a note pad. Love the fun colors! I have always loved stationary any thing to write in or on.But it has to be pretty and I liked them all. I entered your enter form in 2 giveaways including photo fiddle and pad. I actually have a Eye Candy notebook. Love it. I keep it handy for little notes to self. Love cool and cute office supplies. I loved hot chocolate, literally! The drink and the paper. I'm a teacher and love all office supplies. These are all so cute. I love Graphic In Nature and Simply Chic! They are all beautiful though! I couldn't view the collection. No matter what I tried it just wouldn't come up. I think the ones pictured are bright and cheerful and would inspire anyone who had them to want to get things done. :) Thanks for the offer. I just about drooled on my computer keyboard. I heart office supplies! What a neat company. I really liked the Hot Chocolate pattern because I love that dark brown. I work from home, so these supplies would be great to keep me better organized! LOVE LOVE LOVE THIS!!! The Prints Charming is my favorite, but the close second was the whimsical flower. Such a neat collection! graphic in nature is my favorite-- I'm currently in an organizing frenzy, so these would be great! Oh, I am salivating! I love this! I love all the bright colors. Brings out the child in me. I have always loved writing and pretty stationary. I have not been fortunate enough to own any of the collection. Thats why it would be great to win one.!!!!!! I liked most the 4 following: Eye Candy, Graphic in Nature, Hot Chocolate, & Whimsical Flower. I can certainly use it. Thanks! Kathy P. R.
I love their products, I use them for work and to keep track everything that is going on with my growing daughter. I love these all. I have bought some before but love this collection and with a six year old using most of the supplies, this would rock for reorganizing. I would guess my favorite is Prints Charming.. I love the fluffiness and the cleverness of the name. I really like the whimsical flower, but the eye candy looks nice too. Thanks for the chance to win. This would be great! I could really use this since I am in nursing school! Great giveaway! My daughter would love this as well she is a picky ten year old and would use this for school! I am trying to start up a support group for people and families with special needs, and this collection would greatly help me!!! I like them all a lot but I think I really like the hot chocolate the best. I thought the eye candy collection is so bright and colorful. Sure to brighten up anyone's day! I love the Simply Chic collection, I am a college student and my room is done in black, white and hot pink. I love the Prints Charming! I have one of those notebooks already and I take such good care of it, it is my favorite! They all looks so great! Already have bought some products, maybe from the Eye Candy line. But I LOVE the Hot Chocolate line it is so funky and fun. I love all of them for various reasons, but I think Simply Chic best fits my decor. I pick a different style for each area in my life I need to keep logged :) I think I have five different notepads of these. LOVE them. Hi everyone, I am a disabled mom with three children and I do a lot coupon shopping. When I saw this I fell in love with it. The Graphic in nature is so cute and the office set would brighten any mothers or stay at home fathers desk. This is a great combo set! I like the Simply Chic pattern in the pink and black. I love simply chic! The green matches my eyes and the decor in my house. My kitchen is painted jalapeno pepper, and this would look so cute! Even as a child I loved to get new note pads and anything to do with my desk. Today I still buy paper supplies all the time and can't wait to write in my new notebooks. I would love to win this great giveaway. Thank you so much for the offer. I loved them all, but Whimsical Flower fit my mood right now! I love the Hot choclate! These are so great! I love whimsical flower! They are so bright and beautiful!! My favorite is Kendal not only because of the colors but the cause it's for! I love the hot chocolate! Totally me!! Thank you for the fun giveaway! I like the hot chocolate collection it's totally cute and totally me. I love the color combo's. Eye Candy is my favorite.. it's so fun and colorful. The colors really go great together. I love the Eye Candy. It is so bright and cheerful. I looked at all of them, and I think I would like Whimsical nature if it had more vines and stuff and no butterfly. I ended up picking eye candy b/c it is bright but not juvenile. I really love all of them. Very hard to choose from. This site has alot of wonderfully artistic products and I just love the Hot Chocolate Collection. I love plaid and Simply Chic has that "feel". I loved the prints charming collection. Very elegant! love the hot chocolate set! so cute! Like them all.Brights up the day with different pattens.Used for notes at work and at home. I loved the prints charming. I am a papercrafter and I love browns with blues, pinks, greens, so pretty. It would look good in my home office because it would make me smile and a smile always brightens up a room. i love eye candy as well.. I am TOTALLY in love with the Hot Chocolate collection! Thanks so much for the great giveaway! I love the eyecandy set too!THe colors are gorgeous and bright! I have seen all the notebooks but I don't think I have seen the binders before. Thanks for a great giveaway!! I love the Hot Chocolate! I love the soft colors they use and then the brown! Reminds me of coffee or hot chocolate which is comforting and fun!!! I love the Pattern Play. Thanks for the giveaway. I love Eye candy. very colorful and would brighten up my office. Nice giveaway, count me in( prints charming ) Thanks. I love Whimsical Flower because it features gorgeous poppies in bright pinks and reds -- who WOULDN'T want to become more organized? Whimsical Flower matches my new office to a "t". Black & pink - can't get a better combo than that! I love all the patterns but Kendall Kollection is not only beautiful and fun, but wonderful for helping Kendall's fight against Leukemia. Prayers to her and their family. Thanks for an awesome site and give away!! I love prints Charming. What a lovely collection to jazz up your desk!! My daughter Kandaace would love this. She is a college student. I liked the Whimsical flower collection. It is vibrant and beautiful. I will be starting college on June 8th (at 28 years old and 2 kids later)so this would be nice to have. I love Prints Charming! If I don't win I'm going to head back to the website definitely! So girly and elegant! Love the colors. Can't wait to try them. I have never tried them before but the ones I seen on the internet site were all beautiful. I love graphic in nature best :).The colours are so soothing. Love this collection - I just became legally registered as a new business owner! This would be so wonderful for my new home office - starting a business is so expensive what a help this would be! Eye Candy is my favorite. The colors are so bold and, well, eye catching. Wonderful color scheme. Eye candy would add just the flare my office/workstation needs and will brighten my days!! I love the functionality of all of their products. I can't help but love "Eye Candy". I love the vibrant colors. They make me feel happy! Love the graphics in nature. They are as beautiful as they are functional. I love flowers so I loved the whimsical flower one! It would definetly brighten my days! Mine is the Kendall Kollection; those bright, cheery colors are what is making my office seem like a better place! Nothing like 'aqua' to brighten up a room, and bring that beach appeal closer to me! I love the eye candy. I love the vibrant colors. And Whimsical Flower is sooo me. Awesome work!!! My favorite is the Whimsical Flower, I am a flower person, so it just fits. I am lovin this giveaway!!!!!! I love the hot chocolate, the colors and the brown together are awewsome, my daughter and I would fight over the collection for sure. Prints Charming is my FAVE. Don't have a favorite, all so cute and chic! WOW you find the coolest giveaways! I love the Hot Chocolate design! I absolutely adore the Hot Chocolate collection!!! So refreshing! I recently started couponing and see it not only as a fun hobby, but a way I can extend my "gig" as a stay-at-home mommy of 2 precious girls. To organize my Q's, I bought a 3-ring binder at Wal-Mart that was on clearance, but was pleased because even though on clearance it was gorgeous. Not until I filled out this form and viewed the products to pick my fave, did I realize it was from the Hot Chocolate line! How great it would be to recieve MORE HOT CHOCOLATE! I just love the Hot Chocolate! My home office is decorated in a very Earthy way...so the browns and brights would be perfect! I can't believe I won. Thank you so much! my daughter and i have used some of their products, thanks!